Tensions have built as nearly 3,000 migrants from the caravan poured into Tijuana in recent days after more than a month on the road. The federal government estimates the number of migrants could soon swell to 10,000. On Sunday, displeased Tijuana residents waved Mexican flags, sang the Mexican national anthem and chanted “Out! Out!” in front of a statue of the Aztec ruler Cuauhtemoc, 1 mile from the U.S. border. They accused the migrants of being messy, ungrateful and a danger to Tijuana. They also complained about how the caravan forced its way into Mexico, calling it an “invasion.” And they voiced worries that their taxes might be spent to care for the group. A woman who gave her name as Paloma lambasted the migrants, who she said came to Mexico in search of handouts. “Let their government take care of them,” she told reporters covering the protest. Is Mexico doing enough to deter migrants from entering the U.S. illegally? Alden Rivera, the Honduran ambassador in Mexico, told the AP on Saturday that 1,800 Hondurans have returned to their country since the caravan first set out on Oct. 13, and that he hopes more will make that decision. “We want them to return to Honduras,” Rivera said. 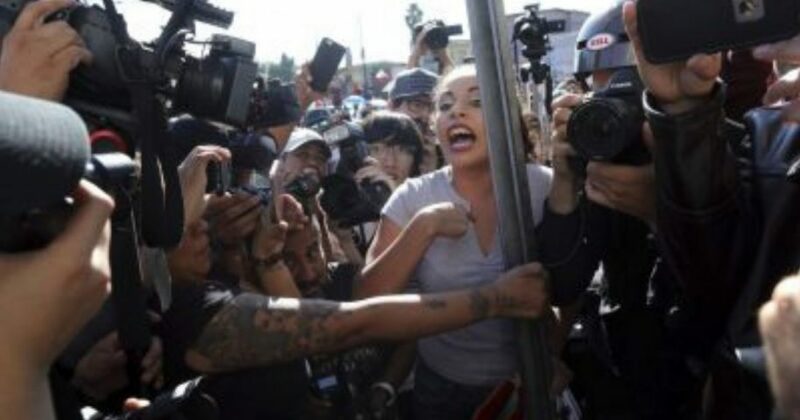 While many in Tijuana are sympathetic to the migrants’ plight and are trying to assist, some locals have shouted insults, hurled rocks and even thrown punches at them. The cold reception contrasts sharply with the warmth that accompanied the migrants in southern Mexico, where residents of small towns greeted them with hot food, campsites and even live music. President Donald Trump, who sought to make the caravan a campaign issue in the midterm elections, used Twitter on Sunday to voice support for the mayor of Tijuana and try to discourage the migrants from seeking entry to the U.S.